Just like a chameleon, the Parrot frame by Martin Szekely transforms before your very eyes. Switched off, it behaves like a mirror, reflecting everything that crosses its path, switched on, it transforms and reveals its secret - your secret - which it has been preciously guarding: the frame can produce more than 1 500 photos, from holiday snaps to photos of the latest addition to the family. All of which are displayed in perfect resolution to maintain all the realism of your memories. 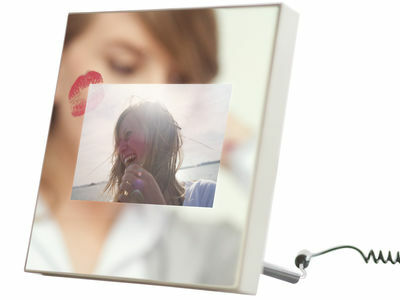 The Parrot digital photo frame made by Martin Szekely is a marvel of today's technology. Featuring Wi-Fi, Bluetooth and NFC capability, you can share and transfer your photos from your PC, Mac, mobile phone, and so on. Furthermore, the SD card slot and USB port make it easy to transfer the photos stored on your PC, USB flash drive or digital camera. Increase the frame's memory by storing your photos on an SD card and maintain the original dimensions of your photos.